There is a time, in the momentum of a moment, when a cycle returns; there is a flash of discovery, and that patterning of illumination returns, when your journey, as experiencer cycles back to reveal itself again to the watchful — what goes around, comes around. But, to the experientiality of the pace of learning the staggering of ideas and exposures: something happens, a flower opens, you learn, listen and remember — and it comes around again. And it did for me. For me, that goes around, and around — what I learned comes back. 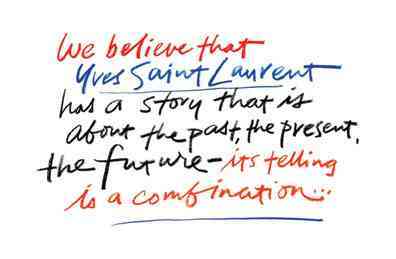 And now, again, Monsieur Yves St. Laurent’s storytelling comes to Seattle. How that story happened? 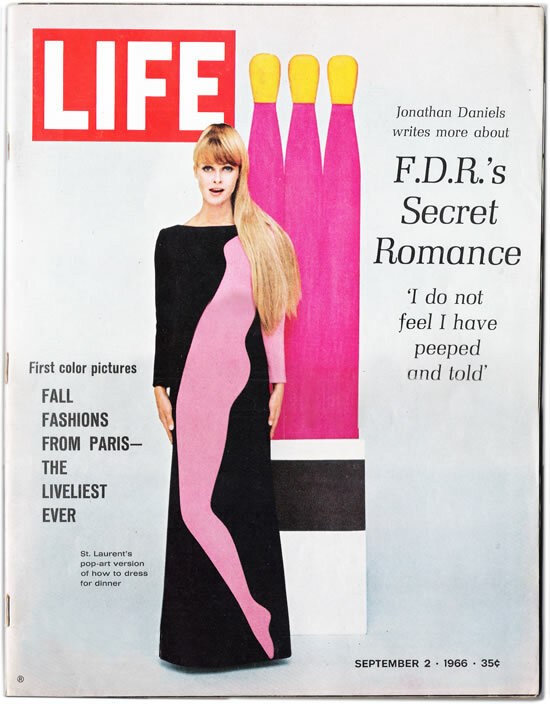 I was in my mother’s painting studio, and there was a magazine, with a story about man — just coming out — a new direction. And I was unforgettably struck. Life. That was 50 years ago. And approaching YSL several years back, it all returned, memories — one flower opens to another. That came back as a branding challenge from Claudia Cividino with the leadership of Laura Lendrum. What is the heart of a brand, and a place that it makes — how to align soul and place, brand story and rekindling a North American presence? Seeing the new show at Seattle Art Museum brought it all back. I was favored with the opportunity to partner with the leadership of Yves Saint Laurent | North America in the development of a brand retail strategy for their US North American flagship store, to be rolled out nationally. 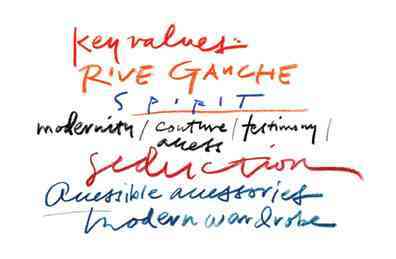 We used Girvin’s proprietary BrandQuest® methodology to explore the heart and spirit of the YSL legacy — and the research of the learnings of the YSL brand constituency. That spiritual string is founded on the premise, and the promise of — a relationship to the genius of Monsieur Yves Saint Laurent. But what, then, of Tom Ford? And then, the character of Stefano Pilati. Designers go on, they move in, move out — but the heart of the brand may lie deep in the soul of that founding creator. To each, in protecting that legacy, a designer may choose to honor that character — or disavow that heritage and simply ride on. Some stay the course. Others, go their way. We went corporate, to Paris to key note positioning by the then CEO of YSL. We started there, gathering global strategy and positioning by Ms. Hermann — and building a foundation on her leadership visioning. The working sessions framed the character of Valérie Hermann’s driving worldwide strategy, then applied, in design theory and brand spirit, to the store conceptions. 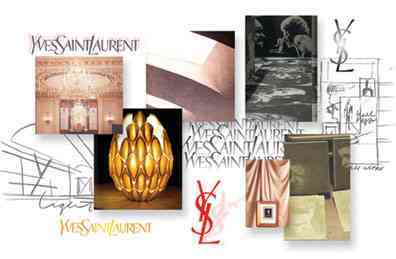 And these values, in interpretation, reflect the original guiding presence of that founding neighborhood — and the couture foundation at St. Sulpice, Yves Saint Laurent’s layered visioning. In a manner it was going forward to the future, but too, looking back, as ever, to key framings of brand imagery — brickwork of assets in heritage. But it was about the beginning — and that translation to a new — a renewed, sense of warmth. Tom Ford explored a darker, harder burnish — stainless steel, black lacquer, rough chipped woods, dark stone: cold, cooly sexual and empowered with the energy and design embrace of Tom Ford’s sleek vision and William Soffield’s architecture. Our recommendation — a turning to curve, a retaining of warmth, new palettes and smooth materiality — a recollection of the beginning, in the new story that was held in the brand power-engine of, back then, Pilati’s thinking about his translation to place-making. We carried our explorations from 57th & 5th, NYC, to the hands of North American retail leadership, Claudia Cividino and Laura Lendrum — then presented in a series of charrettes of brand development in Paris. That warming peachy reference won out — the workshops, the team engagements in Paris, lightened the spirit of the space and the collective strategies explored in the states then captured the emerging spirit of a new retail appearance for YSL. 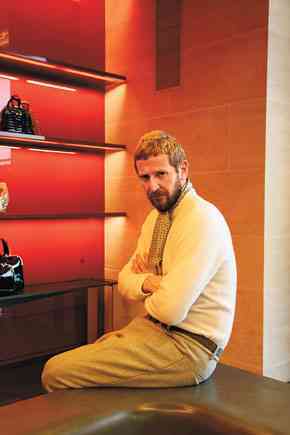 The mastermind, in this evolution: Stefano Pilati — as, then, key creative director of the brand. we needed to find the right presentation of enlightened engagement to Pilati. The official word: The historic Saint Sulpice store, on the Left Bank, inspiration for Saint Laurent’s original Rive Gauche line of luxury ready-to-wear, which first opened its doors in 1979, was then remodeled with a new interpretation, in support of the install consultation with Moatti + Rivière. polished brass and stone and parquet flooring. And, to that telling, that work — then, what goes back, could come forward. 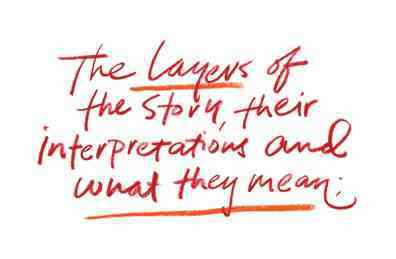 Brickwork foundations, stone on stone – the genetic coding of key milestones in the brand historic storytelling lays out recollections. And they can be remembered by all that know the brand — personally. And what we know, beginning to end, is that the bulk of the community relationships to the key buyers of YSL. 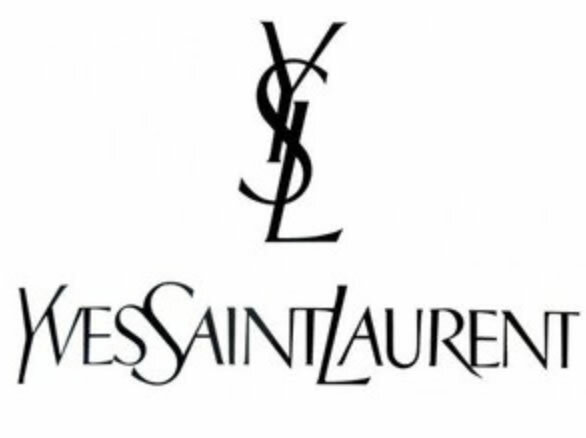 the YSL monogram and Cassandre logo typography finds its reenergizing power. People don’t forget and hold value where value is due. PARIS — “I call it the opium experience,” Stefano Pilati said of Yves Saint Laurent’s striking new-look boutique here at St. Sulpice, with ceilings and wall panels in glossy lacquer the color of the French brand’s legendary perfume bottle and packaging. A custom scent wafting from candles aside, Pilati’s hope is that the store design — to be unveiled to the industry tonight at the start of Paris Fashion Week — is iconic enough to be recognizable without any logo. 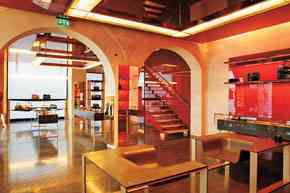 Airy and bright because of pale stone walls, the liquid-look lacquer and accents of polished brass, the boutique is worlds apart from the mostly black, rough-hewn interiors that were in place in 2004 when Pilati took over the design helm from Tom Ford. In separate interviews, Pilati and YSL chief executive officer Valérie Hermann allowed that the dark stores have shortcomings. For example, in some locations, it is difficult to distinguish a garment that is dark brown, say, from one that is black. They said the new design should bring fresh energy to the brand, and fuel double-digit sales at St. Sulpice thanks to more legible merchandising and a more suitable backdrop for Pilati’s ready-to-wear and accessories. St. Sulpice has been home to a YSL boutique since 1979, and Pilati stripped out the warren of rooms and internal walls to expose stone arches and give the store an open feel. Customers alight upon a large selling area showcasing rtw, handbags and accessories, with a shoe salon and cash wrap in a second room off to the left. 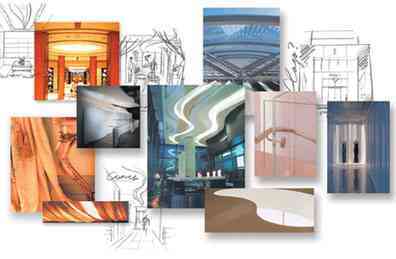 A glass and stone staircase leads to the second level, a larger showcase for rtw. Upstairs, Pilati had interior walls removed to give views of the square. And adaptable, given that no other YSL locations are housed in a landmark 17th-century building in one of the most picturesque squares in Paris. “Every shop is going to have its own identity, but quite linked to what we have done here,” he said. Pilati said he would likely keep the stone walls — “it’s a very French identity,” he noted — but the scale of lacquer panels, for example, would be adapted to each unit. The material, he said, “gives a liquid effect to the store.” And, placed behind racks, they resemble minimalist canvases. Working with architectural firm Moatti & Rivière, Pilati opted for a mix of industrial and luxurious materials, from Baccarat crystal light fixtures to synthetic concrete floors in a typical French parquet pattern. The store also has an environmentally friendly bent in the use of ductal concrete (which uses less water and energy to produce) and efficient lighting. 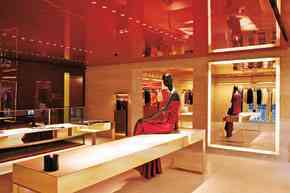 The store also comes with new staff uniforms, opium-colored shopping bags and boxes and spacious, spa-like fitting rooms. It will be used for special events as well, including re-see appointments for the press right after Pilati’s fall show on Thursday.